This week we’re joined by Mike from Middlesbrough FC’s Smog Blog to talk about tomorrow’s Championship clash at Elland Road, what went wrong for them last season and expectations this time round. 2-2 at home to Pompey on opening day, was that considered a good result or two points dropped? It would be easy to see this as two points dropped considering we dropped them in added time, but in reality we were impressed with the lads’ performance, especially considering the players who have gone over the summer. If anything, this match was some way towards providing proof that the ‘Mowbray Effect’ is still in full swing and we can hold our own with a smaller, Championship-standard squad and no more ideas above our station. I had £20 on you and QPR going up last season, what happened? Sorry about that! 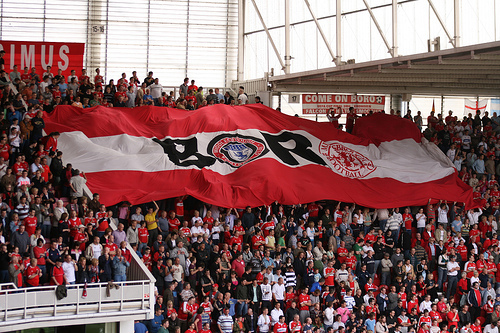 In truth, most Boro fans were a little bewildered that we were pre-season favourites in 2010. Not that I expected it to go as bad as it did, more that we got the impression Gordon Strachan had worked entirely on the spine of the side without paying any mind to wingers or full-backs. As a crappy bonus, neither did we realise that so-called top drawer SPL players would struggle so badly in the English second division. Basically, and with apologies to Leeds supporters, wee Gordon didn’t have a clue and pretty much acknowledged this himself when he walked in October without seeking a penny in compensation. By the time he left, our season was already over. What are your expectations this season, are you expecting a better finish than in 2010-11? Top ten would do for me. I don’t think we’ll go up and would rate us as an outside bet for the playoffs. There are better prepared teams out there and we’ve just undergone an internal revolution that’s been all about shedding the fat and starting again, so this ought to be a year of consolidation. A battling, top half finish is about all we deserve. As you know, we have a reputation for developing young talent. Our first team is now a 50-50 mixture of ‘bought in’ and homegrown players, and the future stars who’ve graduated from the Academy include Richie Smallwood, Cameron Park and Luke Williams. Luke is a striker who’s barely out of short trousers. The others are midfielders, Cameron continuing our proud tradition of churning out left wingers aka Brunt, Downing and Johnson. The best established is Richie, a busy, bustling central midfielder who has come on leaps and bounds in the last twelve months. If you could sign any of the current Leeds United squad, who would it be? We’ve been after a good right winger for years (for some reason, it’s a position we’ve just never filled properly, indeed the last time we had a candidate – James Morrison – Gareth Southgate couldn’t sell him quickly enough), so my pick would be Robert Snodgrass. Simon Grayson’s valued him at £8m, so it’s another ‘dream on’ situation. Most Leeds fans would play down any rivalry with Middlesbrough, but it seems you genuinely hate us! Why is that? We’re lovely really – just misunderstood. It’s a bit before my time, but I think this goes back to the great Leeds team of the 1960s/70s, when any focus on clubs in the Yorkshire region (which we were back then) was sucked into the vacuum of Don Revie’s boys. Rightly so, of course, but there’s nothing like a combination of jealousy and ‘chip on the shoulder’ attitude to get the hackels rising. Perhaps we loathe Newcastle for exactly the same reason, though I appreciate for you guys there are rivalries closer to home and Boro is like the attention-seeking small kid in the corner who’s quietly seething. Leeds United legend Gordon Strachan was appointed for an ultimately unsuccessful spell as manager? Championshop 2011/12 – Three up, three down? Finally, what is your prediction for the game? A score draw, with one of us breaking the others’ hearts with a last minute sickener. TSS Predictions League: Don’t forget to post your predictions for the game in our new Leeds United Forums. "Proud Dissident" t-shirt now available!